Yes! This is the recipe you’ve all been waiting for from Julie at River Run Farm & Pottery! I have to confess, she sent this a while ago but I have yet to become the up-to-date little webmistress I ought to be. Apologies! I haven’t tried this in a gluten free version. But when I do, I will let you know how it goes! 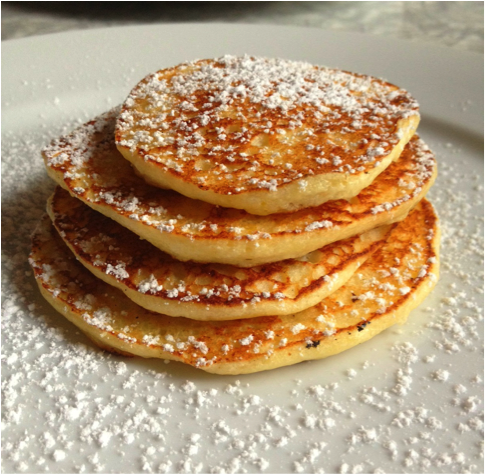 Note to Parents: Julie’s boys, aged 6 and 7, loved these pancakes! I’m super interested in making my own cheese at home. I think this idea was planted by my dear friend Emilie who dreamed (dreams?) of keeping goats and visiting her craftlings in their snug little cheese cave. In our travels we’ve sampled loads of simple fresh and “farmers'” cheeses, as well as those more complicated varieties made by artisans. I LOVE cheese, but it has always seemed like such a specialty culinary talent, far beyond my simple hands. But, I’m learning that there are fairly simple recipes to make cheese and a wide range of techniques to create your own masterpieces. But we need to start at the beginning. Fresh or unripened cheese is the simplest to make and you can use either goat or cow milk. These require no aging nor special enzymes or rennet. You just need good quality milk. By all reports, raw milk makes much better cheese – as in more nutritious as well as tastier, but only as long as the milk has a good flavor. Some raw milk, especially raw goat, can taste like a well manured pasture or worse! And you definitely want to use whole milk, not non-fat or 2%. Rachel, at Lady Liberty Farm, uses raw goat milk which she drains in a plastic mold and then rolls in a combination of dry herbs (especially dill), salt and pepper which is amazing. 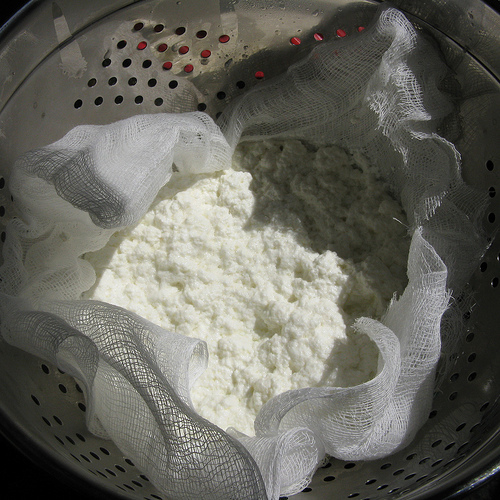 You can also make a harder, “farmers'” cheese from this ricotta by using a weight to press more liquid out of the cheese in the refrigerator. Slowly bring milk, cream (if using), and salt to a rolling boil in a heavy stock pot over moderate heat, stirring occasionally to prevent scorching. Add lemon juice, then reduce heat to low and simmer, stirring constantly, until the mixture curdles, about 2 minutes. Pour the mixture into the lined sieve and let it drain at room temp. The longer you let the mixture drain, the thicker the ricotta. 25 minutes to 1 hour should do, but feel free to experiment. The liquid left in the bowl is what’s called the whey, Ms. Muffet, and you can cook with it! It’s very nutritious, packed full of minerals, proteins and enzymes. Try using whey instead of water or milk in baked goods like bread and pie dough or breakfast treats like pancakes, waffles and French toast. You can also use it in soups and smoothies. If you have too much, freeze the leftovers and use later! Once the ricotta is done draining, you can either serve it immediately (it should be a little warm still) or cover and chill. It should keep in the refrigerator 4-5 days.